Hakon Børresen was one of the last Danish romantics, and the one-act opera The Royal Guest from 1919 was the great success of his lifetime. To this day, the opera remains one of the most popular and frequently performed operas in the entire history of the Royal Danish Opera with 134 stage performances to date as well as a number of concert performances, not least of the charming ouverture. 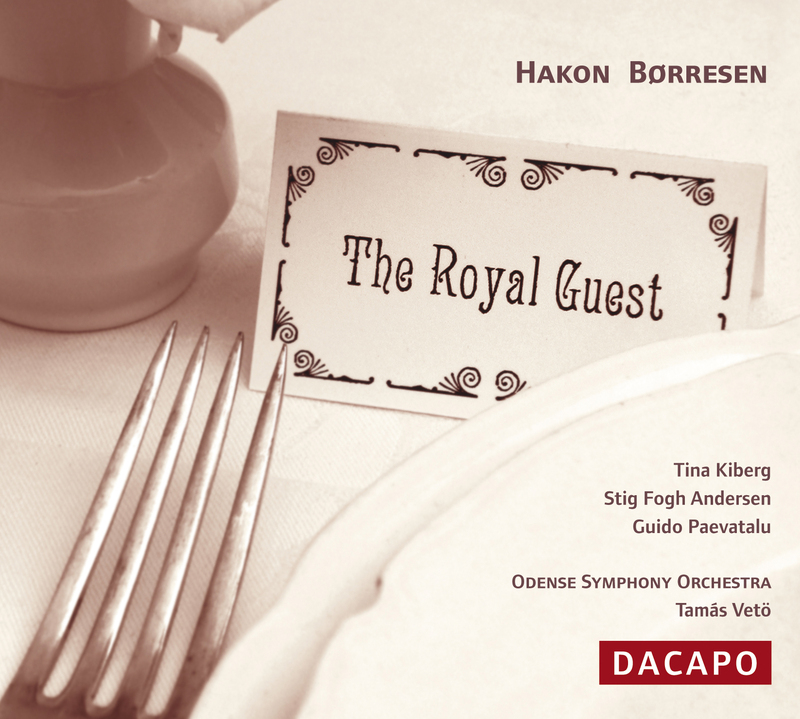 This world premiere recording features internationally renowned singers Tina Kiberg and Stig Ffogh Andersen from the Royal Danish Opera as well as the Odense Symphony Orchestra conducted by Támas Vetö, who received impressive reviews for Dacapo's 2004 release of the opera Belisa (8.226013). Scene 1: 'Skynd dig nu, Ane!' (Hurry up now, Ane!) - (Emmy, Ane, Høyer) 8:59 9,60 kr. Scene 2: 'Der er nok bud efter dig' (Someone must want you!) (Emmy, Høyer, Servant Girl, The Guest) 20:53 19,20 kr. Scene 3: 'Hvad skal vi dog gøre?' (What are we to do?) (Emmy, Høyer, Ane) 5:06 9,60 kr. Scene 4: 'Vi er alene!' (We are alone!) (The Guest, Ane, Emmy, Høyer) 7:11 9,60 kr. Scene 5: 'Ser De min kuffert der?' (Do you see my suitcase there?) (The Guest, Høyer, Emmy) 20:07 19,20 kr. Scene 6: 'Sluk dog de lys!' (Do put out those candles!) (Høyer, Emmy, Ane) 8:54 9,60 kr. Ending: 'Der kør' han, den djævel!' (Off'e goes, the devil!) (Ane) 1:13 6,40 kr. Hakon Børresen was to be one of the last Danish romantics. He had his break-through as a young man around the year 1900, and throughout his life he persevered in the attitudes to art and music that he had learned in his youth. He lived until 1954, and outlived almost all his like-minded Danish colleagues. In the course of his career Børresen did not write an overwhelming amount of music. Besides two operas, his major works are the three symphonies (1901, 1907, 1926), a violin concerto (1904, later performed by Arthur Nikisch, the greatest conductor of the age), a few excellent chamber works (including a sextet and two quartets) and a variety of ballet and stage music. Some of his lieder became very popular in their day, but it was in the opera The Royal Guest from 1919, more than any other work, that he found his element. Børresen was born in Copenhagen in 1876. His paternal grandfather was Norwegian, and at the end of the nineteenth century Copenhagen was still the city to which Norwegians came to carve out a career. The leading Norwegian musician in Copen-hagen in Børresen's time was the composer and conductor Johan Svendsen, who from 1883 until his death in 1911 was conductor of the Royal Danish Orchestra. He did not take on pupils, but at the age of 19 Børresen looked him up anyway for advice on whether his talent was sufficient for a career in music. Bringing with him his opus 1, the national-romantic orchestral piece Thor rides to Jotunheim, he seems to have -kindled a hope in the childless Svendsen of a successor. Svendsen had himself stalled in his composing career and took Børresen as his pupil. They developed what was almost a father-son relationship, and Svendsen remained Børresen's mentor for the rest of his life. Although Hakon Børresen was 11 years younger than his epoch-making colleague Carl Nielsen, he was more conservative, and besides his teacher he admired names like Gade, Grieg, Lange-Müller - and Wagner. Børresen's loyalty to the old world was so great that he would rather stop composing than give in to the musical developments of the period. From the mid-1920s on he wrote only about one piece a year, and after 1940 hardly anything. On the other hand he had a great influence on musical life. He was a powerful and authoritarian chairman of the Danish composers' society Dansk Tonekunstnerforening, and functioned as a kind of unofficial government consultant in musical matters. Later he became chairman of the National Musical Council, and in organizational matters he was the country's leading composer. An unpleasant but necessary palace revolution in the Danish Composers' Society in 1948 marked his sudden and sad farewell to Danish musical life. The aristocratic Hakon Børresen had a large apartment in the heart of Copenhagen and socialized with the Royal Family. But he spent his summers in Skagen in North Jutland, where Scandinavian artists had formed a colony as early as Børresen's childhood. Life in Skagen was also something Børresen persisted in as a framework for his artistic life. By the time of his death in 1954 he was an anachronism, yet he still remained a figure of dignity, kindness and great substance. The Royal Guest is a little fable about how art and love can transform people and change their lives. The main characters are a married couple who are visited in their quiet, static home by a mysterious, effusive guest. With his message of joie de vivre and love he breathes new life into the couple he visits. Whereas Pontoppidan was the realist, the thinker and the connaisseur of souls, Drachmann was the man of energy, the many-minded talent, the lover. Holger Drachmann's oeuvre was very large and versatile, including everything from popular musical productions to poems, novels and plays. He was even an able painter. His great gestures, his beard and hats and his self-dramatization as a ladies' man with many mistresses were all familiar to the public. In the decades after his death his collected works of many thousand pages were published in large printings. Since then his stock as an artist has been in decline, but if one looks at his popularity around the turn of the last century he is one of the most striking representatives of the period. Composers including Heise, Horneman, Grieg, Carl Nielsen and Lange-Müller all set his texts to music. During World War I Børresen was writing his first opera, Kaddara, which is set in Greenland. Børresen even went to Greenland to study life and song there, and the opera ended up as a huge, luxurious affair. When it was finished Børresen was given the rather strange information that the Royal Opera would have liked to stage Kaddara, but because of the war they did not have the coal reserves for such a lavish piece. \\Could you not instead write a small, short opera that we can put on together with a couple of ballets? We have just about had enough of the Italian operas I pagliacci and Cavalleria rusticana, which we normally use for this purpose,\\ said the director of the Opera, Johannes Nielsen. \\So the thought of The Royal Guest occurred to me, and I asked Pontoppidan if he would write the libretto, but he couldn't,\\ said Børresen. \\An opera libretto,\\ said Pontoppidan, \\that would be oh, woe and kiss and bliss - no, I'm no good at that.\\ By roundabout paths Børresen arrived at the versatile author and journalist Svend Leopold (1874-1942). \\He came up to see me in Skagen, where he wrote his excellent libretto in less than a fortnight, and I know that Pontoppidan was extremely satisfied with it,\\ Børresen reminisced in 2. At the Royal Opera the production was premiered with Poul Wiedemann as Dr Arnold Høyer, Tenna Kraft as Mrs Emmy Høyer and Arnold Høeberg as the Guest. The first performance on 15 November 1919 was conducted by Georg Høeberg, the brother of Arnold Høeberg, and one of Børresen's closest friends. For decades the opera was performed with the same cast, and quite incredibly Poul Wiedemann sang the role for 45 years (! ), a total of 134 times, for the last time in 1964. After Poul Wiedemann's farewell performance The Royal Guest disappeared from the Danish opera repertoire, but the opera is still at the top of the list of the most frequently performed Danish operas ever. The Prelude to The Royal Guest also became a popular concert piece, and even at the end of the twentieth century, when the popularity of Børresen's music was at its lowest ebb, it was still a piece he was remembered for. Among the admirers of the Prelude to the opera was the King of Denmark, Frederik IX (1899-1972), who was an able conductor. He regularly attended performances of the opera with a score in front of him, and he had the Prelude in his repertoire (a recording with the King and the Danish National Symphony Orchestra / DR has been released on Dacapo 8.224158-59). In 1927, when the opera was to be performed in Stockholm, the King was even invited to conduct the production - and thus himself to be a \\Royal Guest\\ - but he modestly said no to the task. The Royal Guest is often spoken of as a \\conversation opera\\. The roles are sung in a relaxed parlando, and there are no arias, although moments of emotion rise into more fully elaborated song lines, for example when the Guest describes his home (\\I come from the castle east of the setting sun\\). Hakon Børresen was in fact not a great melodist either, but for the chamber-play-like libretto he found a musical style that functioned perfectly for him. On the other hand it is very clear that he was a brilliant orchestrator. The many changes of mood and surprises in the action gave him the opportunity to really play with the instrumentation. Among his inventive devices are the way the orchestra includes the sound of the parlour piano (and a quotation from Schubert). Not least, the Guest's quirky, uninhibited flow of ideas is portrayed in the orchestral writing with great wit. The Prelude presents a number of motifs from the opera, most clearly the Guest's magnanimous arrival motif. This is a true \\festive polonaise\\ of the kind Børresen had learned to write from Johan Svendsen. Other themes in the Prelude are the Guest's above-mentioned arioso motif and a wistful passage for the woodwinds describing Emmy's thoughtfulness when the Guest has gone. The action takes place in a quiet doctor's home in a remote part of Jutland around the year 1900. Doctor Arnold Høyer and his wife Emmy have been married for a few years and their relations have settled into a calm rut. They rarely have guests, and one day is like another. It is Shrovetide - a time of festivity and pranks - and the family is expecting visits from Copenhagen. Emmy and the old maid Ane are tidying up the home when at short notice the house receives the news that the guests are unable to come. Arnold is at first irritated, but then becomes quite content that his everyday life will not be disturbed. In the evening sleigh bells are heard outside, and an unknown man appears as a guest. Høyer tries discreetly to ask about his identity, but the guest asks to remain anonymous. \\Call me Prince Carnival!\\ he says. Dr. Høyer goes along with the joke, and welcomes the stranger into his home. The Guest talks incessantly, is enigmatic but charming, sociable and to Emmy's delight also musical. To Arnold and Emmy's great surprise he asks that the three of them celebrate together dressed in their finest clothes. The Guest has decided he wants to arouse the spirit, wit and beauty he glimpses in them beneath the conventional surface. At first Emmy refuses to follow the Guest's plan, but Arnold has gradually been infected by the fun. They withdraw to change into their finery. The Guest too has changed into festive garb, and hastens to rearrange the whole parlour with flowers, candles and fruit while Arnold and Emmy are dressing. When they enter the parlour again, somewhat bewildered, they are overwhelmed to see their home transformed. The Guest designates Emmy Queen of the Feast, and they sit down at the table. The Guest is an exuberant party companion who flirts with Emmy and in cryptic language describes his life among the mythological creatures of love. Arnold gradually becomes rapturous, partly from the wine and partly over his wife, who is in the silk dress of her youth. The party develops into a tribute to Eros, and the Guest crowns Emmy with roses in her hair. Suddenly Arnold feels the Guest has crossed the line. The Guest hastily gets up and takes his leave as abruptly as he came. On the doorstep he urges them one last time to let joy and magic into their life. The disappearance of the Guest is a rude awakening for Arnold. At once he becomes his old buttoned-up self, and jealously scolds his wife for permitting the flirting. There is a confrontation between the couple, but they make it up, and admit that they have learned something from the evening. The disturbance of their everyday life has opened their eyes to important sides of life, and they choose to seize the opportunity to let the life-giving excitement in. Like a couple who have just fallen in love, they go arm in arm into the bedroom, while the maid stands gaping at what the Guest has done to her master and mistress. In his libretto Svend Leopold stays loyal to the characterization and chronology of Pontoppidan's story, but chooses to tie a cute ribbon around the tale by allowing the couple's disagreement to be resolved by love. In Pontoppidan's original, however, the evening ends in bitter jealousy, and the last half of the story deals with the highly problematical after-effects of the visit. The restlessness and the rich emotional life that the Guest brings into the home are very much a two-edged sword. But in Børresen's interpretation the positive effects are by far the strongest. Hakon Børresen war einer der letzten dänischen Romantiker. Seinen Durchbruch erlebte der junge Komponist um 1900, und sein gesamtes Leben hindurch behielt er seine jugendliche Einstellung zu Kunst und Musik bei. Er lebte bis 1954 und überlebte damit fast alle seine gleich gesinnten dänischen Kollegen. Børresen komponierte eigentlich nicht so viele Werke. Seine Hauptwerke sind neben zwei Opern die drei Sinfonien (1901, 1907, 1926), ein Violinkonzert (1904, das später von Arthur Niksch, dem damals größten Dirigenten, aufgeführt wurde), einige hervorragende Kammermusikwerke (u.a. ein Sextett und zwei Quartette) und verschiedene Ballett- und Bühnenmusikstücke. Einige seiner Romanzen erfreuten sich bei den Zeitgenossen großer Beliebtheit, doch mit keinem anderen Werk profilierte er sich so stark wie mit der Oper Den kongelige gæst (Der königliche Gast) von 1919. Børresen wurde 1876 in Kopenhagen geboren. Der Großvater väterlicherseits war Norweger, der nach Kopenhagen gekommen war, weil die dänische Hauptstadt Ende des 19. Jahrhunderts für Norweger immer noch als Karrieresprungbrett galt. Der bekannteste Norweger in Kopenhagen war zu Børresens Zeit der Komponist und Dirigent Johan Svendsen, der von 1883 bis zu seinem Tod im Jahr 1911 Kapellmeister der Königlichen Kapelle war. Er nahm keine Schüler an, doch als Neunzehnjähriger suchte Børresen ihn auf, um Svendsen beurteilen zu lassen, ob die Begabung des jungen Mannes für eine musikalische Laufbahn ausreichte. Mit seinem Opus 1, dem nationalromantischen Orchesterstück Tor kører til Jotunheim (Thor fährt nach Jotunheim), weckte er in dem kinderlosen Svendsen offenbar die Hoffnung auf einen Nachfolger. Svendsen war mit seiner eigenen Komponistenlaufbahn in eine Sackgasse geraten und nahm Børresen als Schüler an. Zwischen den beiden entwickelte sich eine Art Vater-Sohn-Beziehung und Svendsen blieb Børresens lebenslanges Vorbild. Hakon Børresen war zwar elf Jahre jünger als sein epochaler Kollege Carl Nielsen, war aber von seiner Haltung her konservativer und bewunderte neben seinem Lehrer ältere Namen wie Gade, Grieg, Lange-Müller - und Wagner. Børresen hielt der alten Welt so sehr die Treue, dass er das Komponieren lieber ganz aufgeben als der zeitgenössischen musikalischen Entwicklung nachgeben wollte. Ab Mitte der 1920er Jahre schrieb er nur noch etwa ein Werk pro Jahr, nach 1940 fast überhaupt nichts mehr. Dafür hatte er aber großen Einfluss auf das Musikleben. Er war ein mächtiger und autoritärer Vorsitzender des Dänischen Tonkünstlerverbands und fungierte in musikalischen Fragen als eine Art inoffizieller Regierungsberater. Später leitete er auch den staatlichen Musikrat und war in diesen organisatorischen Zusammenhängen der führende Komponist des Landes. Eine unschöne, doch nötige Palastrevolution im Dänischen Tonkünstlerverband brachte ihm 1948 den abrupten und traurigen Abschied vom dänischen Musikleben. Der aristokratische Børresen hatte eine große Wohnung im Herzen von Kopenhagen und verkehrte mit der königlichen Familie. Die Sommer verbrachte er in Skagen, wo skandinavische Künstler schon während Børresens Kindheit ihre eigene Kolonie gebildet hatten. Auch an seinem Leben in Skagen hielt Børresen fest, für ihn war es der passende Rahmen eines Künstlerdaseins. Bei seinem Tod im Jahre 1954 war er ein Anachronismus, seine Freundlichkeit und seine große Würde hatte er jedoch nicht verloren. Der königliche Gast ist eine kleine Fabel darüber, wie Kunst und Liebe Menschen verwandeln und ihr Leben verändern können. Die Hauptpersonen sind ein Ehepaar, das in seinem gefühlsmäßig stagnierenden Zuhause von einem geheimnisvollen, überschwänglichen Gast aufgesucht wird, der mit seiner Lebensfreude und Liebe verkündenden Botschaft dem gemeinsamen Leben des Ehepaars neue Glut einhaucht. Børresen fand in der Vorlage „ein schönes Motiv für die musikalische Bearbeitung, besonders anregend, wenn man im Kreis feiernder Künstler oder vielleicht eher noch im engsten Freundeskreis unter dem Einfluss von Drachmanns Persönlichkeit gestanden hat (...) In allen Familien, denen Drachmann die Kunst und die Poesie nahe brachte, wurde das Leben reicher, aber auch unruhiger\\. Pontoppidan war der Realist, der Denker und Seelenkenner, Drachmann dagegen der Energiemensch, das Multitalent, der Liebhaber. Drachmanns Werk war umfassend und vielseitig, reichte von volkstümlichen Musikvorstellungen bis zu Gedichten, Romanen und Dramen. Er war sogar ein versierter Maler. In der Öffentlichkeit bekannt waren seine großen Gebärden, sein Bart und seine Hüte und seine Selbstinszenierung als Erotiker mit vielen Liebhaberinnen. In den Jahrzehnten nach seinem Tod erschienen seine Tausende von Seiten umfassenden gesammelten Werke in hohen Auflagen. Später wurde seine Tätigkeit allmählich kritischer beurteilt; richtet man sich jedoch nach der Verbreitung seiner Werke um die Jahrhundertwende, so zählt er zu den markantesten Vertretern der Zeit. Seine Texte wurden u.a. von Heise, Horneman, Grieg, Nielsen und Lange-Müller vertont. Während des Ersten Weltkriegs schrieb Børresen seine erste Oper. Kaddara, so der Titel, spielt in Grönland. Børresen reiste sogar nach Grönland um das dortige Volksleben und Liedgut zu studieren, und die Oper wurde schließlich eine große und reich ausstaffierte Sache. Als sie fertig war, erhielt Børresen vom Königlichen Theater den etwas sonderbaren Bescheid, dass man die Oper gern aufführen wolle, aufgrund des Krieges aber nicht genügend Kohlereserven für ein solches Ausstattungsstück habe. „Können Sie nicht stattdessen eine kleine, kurze Oper schreiben, die wir zusammen mit zwei Balletten bringen können? Die italienischen Opern Bajazzo und Cavalleria rusticana die wir für diesen Zweck benutzen, hängen uns schon bald zum Halse heraus,\\ sagte Theaterchef Johannes Nielsen. „Da fiel mir Der Königliche Gast ein und ich fragte Pontoppidan, ob er das Libretto schreiben würde, aber das konnte er nicht,\\ berichtet Børresen. „Ein Operntext\\, sagte Pontoppidan, „das ist ja wohl so etwas mit Herz und Schmerz - nee, dafür tauge ich nicht.\\ Über Umwege geriet Børresen schließlich an den vielseitigen Schriftsteller und Journalisten Svend Leopold (1874-1942). „Er kam zu mir nach Skagen, wo er in weniger als vierzehn Tagen seinen trefflichen Text schrieb, und ich weiß, dass Pontoppidan damit sehr zufrieden war,\\ erinnerte sich Børresen 1942. Am Königlichen Theater hatte die Vorstellung Premiere mit Poul Wiedemann in der Rolle als Dr. Arnold Høyer, Tenna Kraft sang seine Gattin Emmy und Arnold Høeberg war der Gast. Die Uraufführung am 15.11. 9 dirigierte Arnolds Bruder, Georg Høeberg, einer von Børresens engsten Freunden. Jahrzehntelang ging die Oper mit der gleichen Besetzung. Poul Wiedemann sang die Partie unglaubliche 45 Jahre (! ), insgesamt 134 Mal, das letzte Mal 1964. Nach Wiedemanns Abschiedsvorstellung verschwand Der königliche Gast aus dem dänischen Opernrepertoire, hält sich aber dennoch auf der Liste der am häufigsten gespielten dänischen Opern. Das Vorspiel der Oper wurde zudem ein beliebtes Orchesterstück. Selbst am Ende des 20. Jahrhunderts, als sich Børresens Musik im absoluten Kurstief bewegte, war das Stück unvergessen. Zu den Bewunderern des Vorspiels der Oper gehörte der dänische König Frederik IX. (1899-1972), selbst ein fähiger Dirigent. Er hatte bei den Aufführungen der Oper fast immer die Partitur vor sich. Das Vorspiel zählte zu seinem festen Repertoire (eine Aufnahme mit dem König und dem Dänischen Nationalorchester / DR ist als Dacapo 8.224158-59 erschienen). Als die Oper 1927 in Stockholm gegeben werden sollte, lud man den König sogar ein, die Vorstellung zu dirigieren und damit selbst als „königlicher Gast\\ aufzutreten, eine Aufgabe, die er jedoch bescheiden ablehnte. Der königliche Gast wird häufig als „Konversationsoper\\ bezeichnet. Die Partien werden im ruhigen Parlando gesungen und es gibt keine Arien, obwohl sich bewegte Momente durchaus zu ausgefeilteren Liedlinien aufschwingen, z.B. wenn der Gast berichtet, wo er herkommt („Ich komme aus dem Schloss, das im Osten des Sonnenuntergangs liegt\\). Børresen war eigentlich auch kein großer Melodiker, fand für das kammerspielhafte Libretto jedoch einen musikalischen Stil, der ihm perfekt lag. Dafür ist seine Brillanz als Orchestrator ganz unverkennbar. Die zahlreichen in die Handlung eingebauten Stimmungswechsel und Überraschungen bieten ihm Gelegenheit, wirklich mit der Instrumentierung zu spielen. Als besonderen Einfall nimmt das Orchester (mit einem Schubertzitat) den Klang des Wohnungsklaviers auf, und nicht zuletzt der schnurrige, ungezügelte Einfallsreichtum des Gastes wird im Orchestersatz mit viel Witz porträtiert. Das Vorspiel bringt mehrere Motive der Oper, am deutlichsten das großherzige Ankunftsmotiv des Gastes, das als echte „Festpolonaise\\ präsentiert wird, wie Børresen sie bei Johan Svendsen gelernt hatte. Weitere Motive im Vorspiel sind das erwähnte Arioso-Motiv des Gastes und ein wehmütiger Bläserabschnitt, der Emmys Nachdenklichkeit nach der Abreise des Gastes schildert. Die Handlung spielt in einem ruhigen Arzthaushalt, irgendwo in einem verlassenen Nest in Jütland um das Jahr 1900. Der Arzt Arnold Høyer und seine Frau Emmy sind bereits einige Jahre verheiratet und ihr gemeinsames Leben bewegt sich in gelassenen Bahnen. Sie haben nur selten Besuch, die Tage vergehen ziemlich gleichförmig. Es ist Fastnacht, die Zeit für Feste und Narrenstreiche, und die Familie erwartet Besuch aus Kopenhagen. Frau Emmy und das Stubenmädchen Ane richten gerade alles her, als die Gäste kurzfristig absagen. Arnold ist zuerst verärgert, danach aber eigentlich ganz zufrieden, weil sein Alltag damit letztlich ungestört bleibt. Am Abend erklingen draußen Schlittenglocken, ein unbekannter Mann meldet seine Ankunft als Gast. Høyer versucht ihn diskret nach seiner Identität auszufragen, doch der Gast bittet darum, anonym bleiben zu dürfen. „Nennen Sie mich Prinz Karneval!\\ sagt er. Dr. Høyer lässt sich auf den Spaß ein und heißt den Fremden in seinem Haus willkommen. Der Gast redet ununterbrochen, ist rätselhaft, aber charmant, gesellig und zu Emmys Freude auch musikalisch. Zu Arnolds und Emmys großer Überraschung schlägt er ihnen vor, sich in Schale zu werfen und mit ihm ein Fest zu feiern. Der Gast möchte den Geist, den Witz und die Schönheit wecken, die er hinter der konventionellen Fassade des Ehepaares ahnt. Emmy weigert sich zunächst, dem Plan des Gastes zu folgen, aber Arnold ist von dem Ulk schon angesteckt. Sie ziehen sich zurück, um sich umzukleiden. Auch der Gast trägt inzwischen einen Frack und schmückt den Raum eiligst mit Blumen, Kerzen und Obst, während sich Arnold und Emmy umziehen. Als sie verdutzt das Wohnzimmer betreten, sind sie überwältigt von der Verwandlung, die ihr Zuhause erfahren hat. Der Gast kürt Emmy zur Ballkönigin und sie gehen zu Tisch. Der Gast ist ein überschwänglicher Tischherr, der Emmy den Hof macht und in verschlüsselten Wendungen sein Leben unter den mythologischen Wesen der Liebe schildert. Arnold wird immer seliger, das machen der Wein und seine Frau, die das Seidenkleid ihrer Jugend trägt. Das Fest gerät zu einer Hymne an Eros, und der Gast krönt Emmy mit Rosen. Plötzlich ist Arnolds Grenze überschritten. Der Gast bricht hastig auf und verabschiedet sich ebenso plötzlich, wie er gekommen ist. Auf der Schwelle mahnt er sie noch einmal, die Freude und das Märchen in ihr Leben einzulassen. Das Verschwinden des Gastes bedeutet ein jähes Erwachen für Arnold. Plötzlich ist er wieder der alte beschränkte Arnold, der seiner Frau eine Eifersuchtsszene macht, weil sie sich hat umwerben lassen. Es kommt zu einer Auseinandersetzung, doch die beiden versöhnen sich wieder und erkennen, dass sie aus dem Abend etwas gelernt haben. Der Bruch ihrer Alltagsroutine hat ihnen die Augen für wichtige Seiten des Lebens geöffnet. Sie folgen der Aufforderung, die Leben spendende Unruhe in ihr Leben einzulassen. Wie Jungverliebte gehen sie Arm in Arm ins Schlafzimmer, während das Stubenmädchen darüber staunt, was der Gast mit ihrer Herrschaft angestellt hat. Svend Leopold hält sich mit seinem Libretto in Personendarstellung und Chronologie eng an Pontoppidans Erzählung, bindet aber eine liebevolle Abschlussschleife, indem er die Unstimmigkeit des Paares in Liebe auflöst. In Pontoppidans Vorlage endet der Abend dagegen in heftiger Eifersucht und in der zweiten Hälfte der Novelle geht es um die äußerst problematischen Nachwirkungen des Besuchs. Die Unruhe und der Gefühlsüberschwang, die der Gast in das Leben des Paares hineinträgt, sind eine höchst zweischneidige Angelegenheit. In Børresens Auslegung überwiegen dagegen bei weitem die positiven Wirkungen.